This speaker is really stylish and suited to the college scene. This would be a great PA system if you're organizing a video game tournament, a camping trip with buddies, a sports day event, or a cook out. This sleek speaker is no kid's toy. It puts out a decent 420 Watts of peak power and its side mounted tweeters really spread the sound around. You could take this with you when you go away on spring break with a crowd. The speaker has a rechargeable battery that lasts for 3-5 hours and it also has a carry handle. It would be great for the beach, boating on the lake, or even a fishing trip on the ocean. You get a mic with it, so if you are organizing a crowd, you can use it to give out instructions. The unit looks cool with a charcoal grey casing and lights around the woofer, the tweeters, and the buttons. 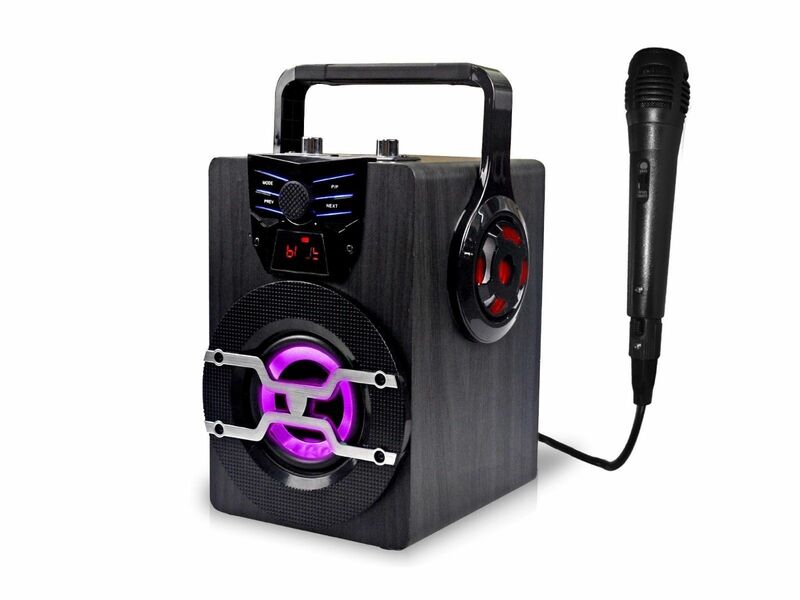 You don't just need this speaker as a portable PA system you can play music on it, too. There is a built in FM radio and it has a USB port to connect a memory stick, a slot for an SD card and a 1/8-inch socket to connect the headphone output of your MP3 player or iPod. Better still, the speaker has Bluetooth capabilities, so you can connect it to your smart phone. Any Bluetooth device you have can connect wirelessly from up to 30 feet away. Have a great time with your buddies and enjoy the wireless world with this liberating music center and PA system. Choose the Technical Pro WASP420 to share your music with your friends.